With positive local and international polls' predictions as well as the groundswell of endorsements by all the socio-political groups in favour of the presidential candidate of the Peoples Democratic Party (PDP), Alhaji Atiku Abubakar, it appears history might be on the verge of repeating itself. In the run-up to 2015 presidential election, the name on the lips of Nigerians was Muhammadu Buhari - a born-again dictator-turned-democrat. He was thought as the messiah that Nigerians were waiting for, and the sweeping slogan was 'change'. The reason was not far-fetched. Then ruling party, the Peoples Democratic Party (PDP) had become a god wreaking havoc on the socio-political and economic psyche of the masses. The administration led by former president Goodluck Jonathan had been enmeshed with corruption and maladministration. Nigerians were therefore desperate for a change in government. It became a case of anyone but Jonathan. The All Progressives Congress (APC) had smartly played on the emotions of Nigerians, which came with a change agenda to fight corruption that was already walking on the streets, reform the economy and battle insecurity, among others. The party promised Nigerians heaven on earth. It wasn't difficult for them to convince Nigerians to vote for them as the continuity of PDP was considered suicidal. Thus, with local and international polls, emboldened by staggering endorsement as well as foreign tacit support, the journey to Aso Rock became a smooth ride for Buhari and the APC, 12 straight years after Buhari's three attempts at the presidency. Three years down the line, nothing much changed. The more things changed, the more they looked the same. The ruling party's performance has suddenly become a disaster. The dictatorial nature of Buhari is still as it used to be. His respect for rule of law has never been as bad. His nepotistic tendency is helplessly ever present. The standard of living in the country has dropped sharply like the price of crude oil in the world market. Above all, his monumental failure in office has attracted the anger of Nigerians hence political analysts are of the view that Buhari's re-election bid is a huge mistake that must not be repeated. With just days to the presidential election, the presidential candidate of the PDP, Alhaji Atiku Abubakar, has become the new rally point, a unifier of the fragile country and a symbol of hope. While no one might be expecting the former vice president to perform miracles if he eventually wins the presidential election, his message of hope has attracted the interest of Nigerians and the message arising from this is crystal clear; that Atiku will be far better than the incumbent president, which seems not to be aware of anything happening in his government. In addition, international polls have also predicted a comfortable and decent win for the PDP candidate on a number of occasions. In September 2018, HSBC in its report put together by its Global Research Unit and titled: 'Nigeria, Papering over the Cracks,' said Nigeria's current economic struggles look set to continue if Buhari wins a second term in office. The financial institution posited that although the incumbent president's "approval ratings sit near all-time lows," a development it said "largely reflects the impact of Nigeria's painful recession in 2016-17 and the sustained economic hardship that has accompanied his presidency, including rapidly rising joblessness, and poverty," the president will once again lead the APC into the 2019 elections. HSBC, however, stated that "A second term for Mr. Buhari raises the risk of limited economic progress and further fiscal deterioration, prolonging the stagnation of his first term, particularly if there is no move towards completing the reform of the exchange rate system or fiscal adjustments that diversify government revenues away from oil." But the Presidency in its reaction said it wished to make it clear to all Nigerians particularly, the global banking giant HSBC which said the second term of Buhari would stunt the economy, that what killed Nigeria's economy in the past was the unbridled looting of state resources by leaders, the type actively supported by HSBC. It said a bank that soiled its hand with "millions of US dollars yet-to-be-recovered Abacha loot", and continued until a few months ago to shield the stolen funds of one of the leaders of the Nigerian Senate has no moral right whatsoever to project that a "second term for Mr. Buhari raises the risk of limited economic progress and further fiscal deterioration." Also in the same 2018, The Economist Intelligence Unit (EIU) Africa, the research unit of the London-based The Economist Magazine, said that the PDP would win the 2019 election. Again, last week, The Economist insisted that Atiku would win the February 16 presidential election. EIU Africa said the margin of victory was getting narrower as the election approaches, but Atiku and his political party will win the historic election. It states: "Less than two weeks before #Nigeria's presidential election. Abubakar has floated the idea of corruption amnesty. It is arguably an impolitic time for such a delicate proposal. Abubakar is hard-pressed to convince voters that he is a clean politician, having been on the receiving end of numerous graft allegations in the past. We retain our forecast for #Abubakar to win, but expected the margin of victory is narrowing as the poll approaches." Aside the international polls, which have all been in favour of the PDP presidential candidate, the United States government a few weeks back had tactically supported his candidacy by granting him a visa to visit the country after twelve years visa ban. This finally put a nail to the coffin of speculation that his inability to secure the US visa was due to an allegation of corruption against him. His recent visit to the US afforded him the opportunity to meet with some US government officials. His inability to travel to the US had formed a crux of the campaign of the ruling party going into the February 16, 2019, presidential election. Atiku's presidential ambition further received a major boost, when last week, he was endorsed by Afenifere Renewal Group, Middle Belt Forum, Ohaneaze Ndigbo, Northern Elders Forum (NEF) and Pan Niger Delta Forum (PANDEF). The Forum of Nigerian Elders and Leaders had during its meeting held at Sheraton Hotel, Abuja, thrown its weight behind the former vice president. In the Nigeria political system, such endorsement was a major boost as such socio-political groups have a huge influence on their people in their respective domains. But the federal government immediately described the endorsement as a 'voodoo' endorsement. But 24 hours after the endorsement by the elders of thought, a group of retired ex-military generals, hurriedly endorsed the second term bid of Buhari, to balance the unfolding political game. The ex-generals were led by the former military administrator of Lagos state, Brig-Gen. Buba Marwa, (retd. ), came along with 13 Major Generals, eight Air Vice Marshals, two Rear Admirals, 12 Brigadier-Generals, nine Air Commodores, 8 Commodores and 17 former military administrators to the presidential villa. 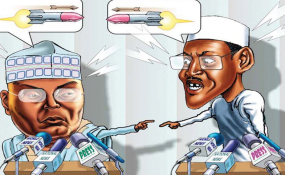 Without fear or favour, the ex-generals that endorsed the president's re-election bid are not in the mould of former president Olusegun Obasanjo, Gen. Theophilus Danjuma, former Heads of State Ibrahim Babangida, and Gen. Abdulsalam Abubakar, among others and as such, are not politically savvy to influence the voters. Reacting to the endorsement, however, PDP's Director of Media and Publicity, Mr. Kola Ologbondiyan, said the endorsement was to create an aura that does not exist around Buhari. "We consider this endorsement as name-dropping, just to create an aura that does not exist around President Buhari. Young officers are being killed and no General has spoken on how to curb the insurgency and banditry. "Is it now that Nigerians are tired of the governance style of President Buhari that Generals will be endorsing him? When bandits are taking over Zamfara and even Katsina, the home state of Buhari? The PDP does not believe any General worth his salt will do that," added. Generally, the February 16 presidential election will not be a walkover for the ruling APC, because it will be a fight to finish between the party and the main opposition party, the PDP. And with the recent run of goodwill Atiku is enjoying, it won't be a surprise if he wins the most coveted trophy of his political career.